Learn to play the intro section for “Invade” by Within The Ruins a cool melodic metalcore track with my Invade guitar tab. The first thing to start with is the tuning explanation then we move on to the intro, 1st chorus and 1st breakdown notated. 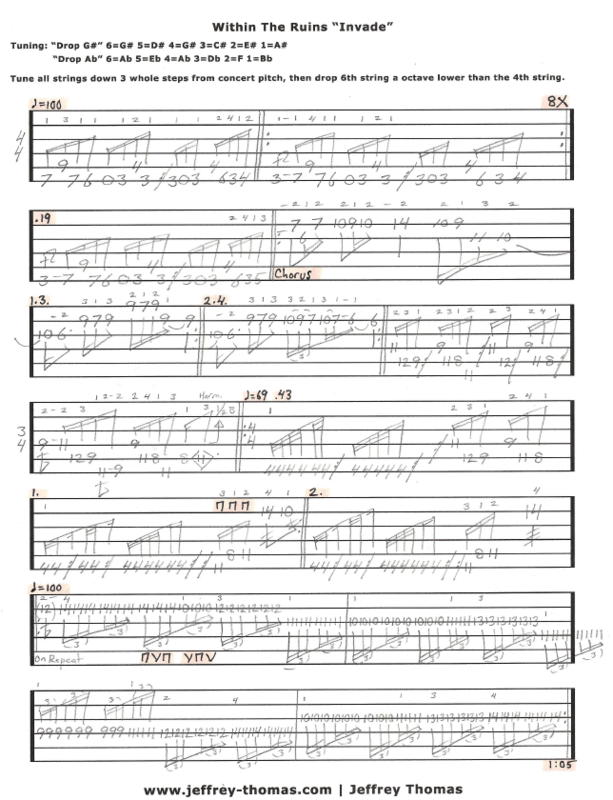 Detailed tablature with rhythmic values, fingerings and picking techniques. Over 1 minute of the track notated for a great start. Let me know if you are interested in continuing with this track? Want the guitar tab for free? Just send in your email address using the form provided. Looking for online guitar lessons? Fill out the Schedule A Free Lesson form to set up your free Skype guitar lesson today. “Invade” is the second album by the American Deathcore band Within The Ruins. Make sure to look through my online video guitar archive for more free video guitar lessons.